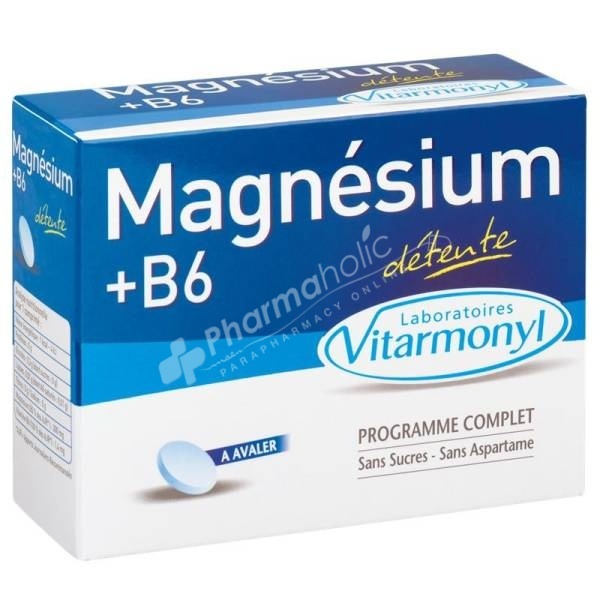 Help find a better balance nerve and promote relaxation with magnesium and vitamin B6. Magnesium due to its action on the neuro-muscular function, helps fight against fatigue nervous transient stress-related or overwork. Vitamin B6 strengthens its activities and is involved in emotional balance. For people who are stressed or feeling nervous fatigue. Sugar free - Aspartame free. 1 tablet daily, swallowing, preferably in the morning. Program: 30 days, repeat if necessary. Mineral: magnesium oxide; Bulking: sorbitol; modified starch; coating agents: derivative of cellulose, titanium dioxide, polydextrose, talc, maltodextrin, medium chain triglycerides; anti-caking agent: magnesium salts of fatty acids; vitamin B6. 1 tablet provides 300 mg of magnesium (80% RDA *) and 1.4 mg of vitamin B6 (100% RDA *). * RDA: Recommended Daily. Consume as part of a varied and balanced diet and a healthy lifestyle. It is advisable not to exceed the recommended dose. Not for renal failure. Excessive consumption may have a laxative effect. Store in a cool, dry place. Keep out of reach of children.